CON IS UPON US! YukomiCon 2017!! YukomiCon 2017 starts Friday, August 25th and runs through Sunday August 27th. This is the third-ever YukomiCon, and it’s going to be the best one yet! For three days, Whitehorse will be buzzing, and to help celebrate Canada’s 150th birthday, we’re showing off the best of Canadian geek and comic culture! It’s three days packed with as many panels, vendors, workshops, and cosplay as you can handle – not to mention our line-up of special celebrity guests! There are lots of announcements to come, so check back often for updates on the line-up, the schedule, and get ready for the geekiest weekend of the year! And make sure you come check out the Titan Gaming booths for great deals all weekend!! Come join us for the first FCBD in our new location! Celebrate and discover the amazing world of comic books on Free Comic Book Day! 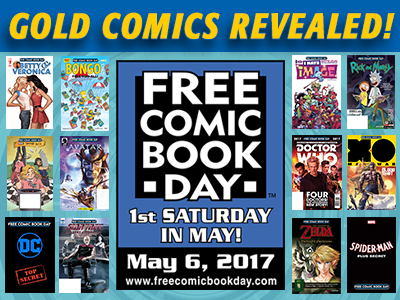 Free Comic Book Day is the day when Titan Gaming gives away comic books absolutely free to anyone who comes into the store! Choose three comics per person, and with over 30 titles to choose from, there’s a story for everyone to enjoy! It’s going to be another exciting week at Titan Gaming Cafe! 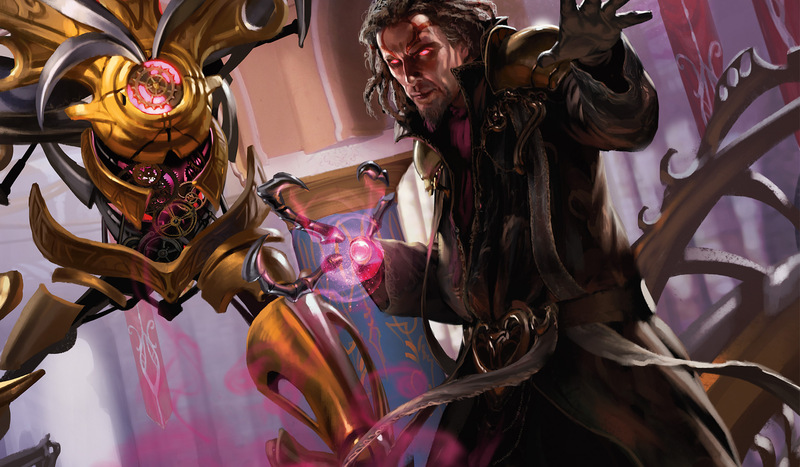 It’s the last week before GP Vancouver and we have Modern as part of the Game Day on Saturday. We have our hottest new format Murdoch Frontier on Friday. Saturday is going to be a packed house with the aforementioned Game Day taking place downstairs, regularly scheduled Pokemon League on the main floor as well as our good friends at YCCS letting us host their Board Game Drop in. Board Game Drop-in takes place from Noon to 5 check out the event page on the YCCS Facebook Page or the shared link from our page earlier in the week! Pokemon League will take place from 2-4pm. No cost, just show up and play! Don’t know how to play but you want to learn? Our wonderful Professor Steve will be here to help! There are great prizes for just getting in games, win or lose. Last Saturday of each month will have a tournament. $5 entry and everbody gets a pack. Additional prizes for finishing higher up in the ranks. 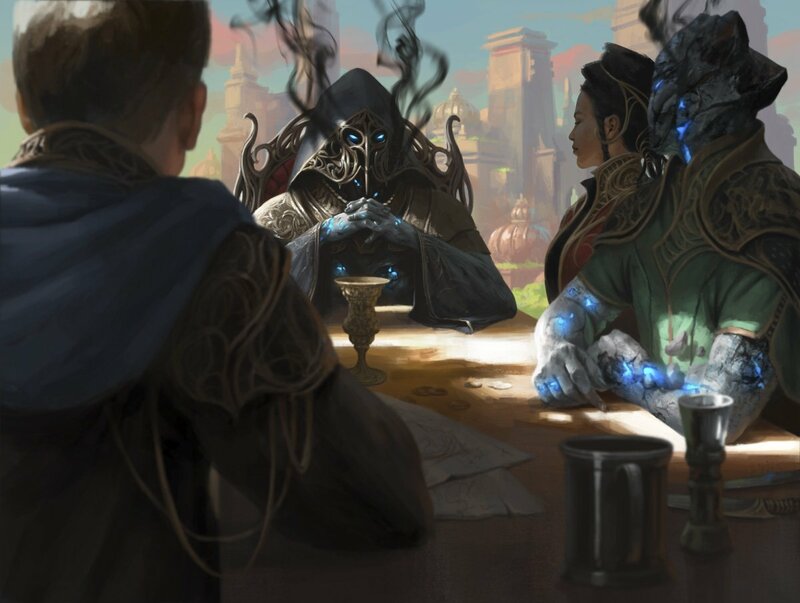 Finally Game Day Aether Revolt takes place on Saturday from Noon to 5ish. The format is modern (remember the most recent bans). $5 Entry, everyone gets a pack and a wonderful playmat for the eventual winner. Sunday also hosts a Game Day event with Draft starting at Noon. $15 entry. 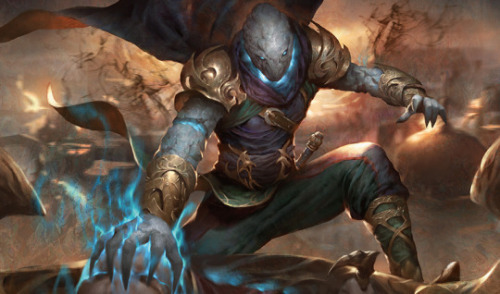 Winner will also receive an awesome champion playmat. All Game day participants will receive a special full art card for playing as well as the top 8 will get a premium foil full art. 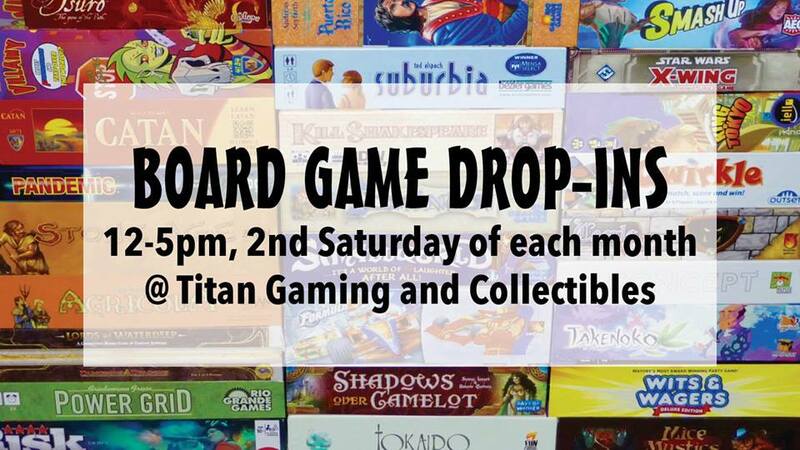 Join The YCCS and Titan Gaming Cafe on the second Saturday of each month at Titan Gaming and Collectibles to roll dice, shuffle cards, and move meeples! Choose from over 60 games in the YCCS board game library, or bring a game of your own. Groups and individuals of all ages welcome. Its that time again. Its been a month since set realease! Welcome to Aehter Revolt Game day! Sunday at Noon again we go to war in Draft. Come smash your oponents with whatever crazy cards you can pull. $15 Entry. 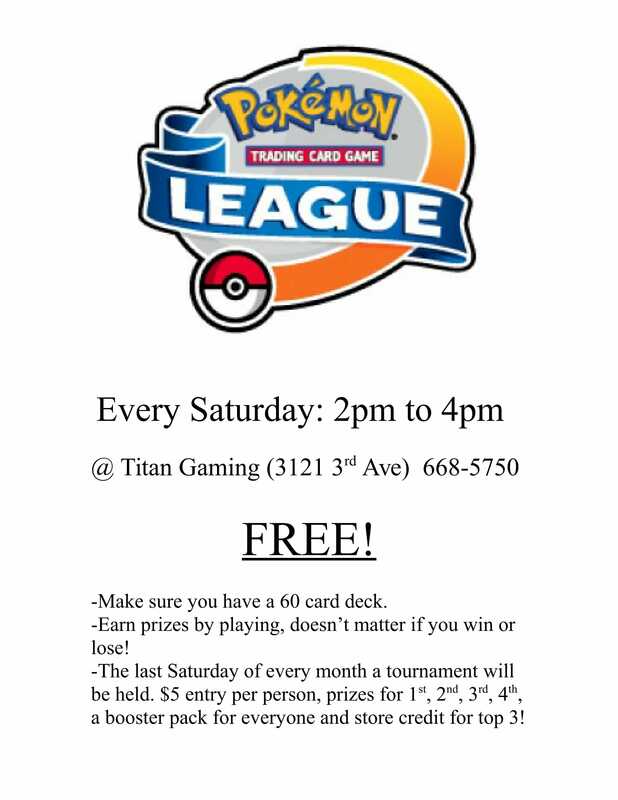 Dont forget folks that EVERY Saturday is Pokemon League! From 2-4pm come test your might against other Trainers. Earn prizes just by playing and make new friendships. The last Saturday of each month there is also a tournament, $5 entry, everybody gets a booster pack. Prizes to the top finishers! Only 5 more days until Aether Revolt Prerelease. This will be the first big magic event in the new store location! Come check out the new place, play the new set, and win prizes! Each win you achieve in an event gets you a pack of the brand new Aether Revolt but nobody goes home empty handed. Remember to come in and sign up ahead of time. Each sealed event you will receive a Aether Revolt prerelease pack. Saturday at 10 AM we will be doing the first sealed event. $30 ahead of time or $35 on the day of. Saturday Night will be for the first time in Titans history a draft during the prerelease. Event will begin at 5:30 PM, $15 entry no matter when you sign up. Sunday morning we get back at it at Noon for another sealed pool. $30 ahead of time or $35 on the day of. 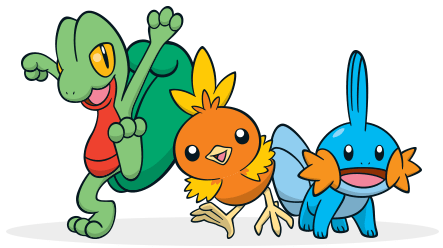 The Pokemon League returns to Titan Gaming! Prizes and promos for top players! 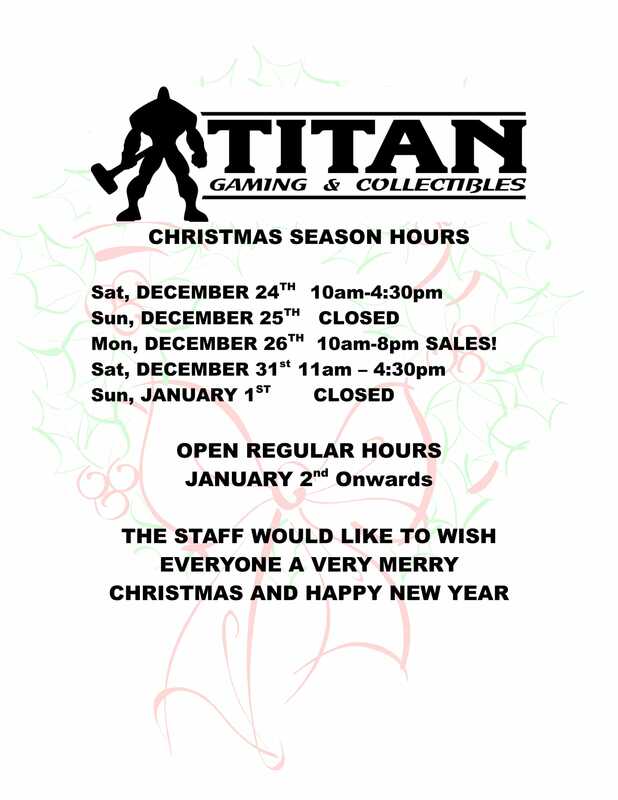 As promised Titan’s Holiday hours. Make sure to hit us up over the holidays for your last minute holiday shopping. We will have some great sales on Boxing Day as well. From the staff at Titans: Have a happy holidays, stay safe and warm!